When we build any custom solution in Salesforce, key is to write an efficient and meaningful Apex test classes for sure. However sometime we may need to test how custom application would behave in maximum operating capacity. Here, I am talking about Load Testing of custom applications built on top of Force.com platform. Recently I needed to push my code to its limit to know how many concurrent users can use it before hitting any governor limits. 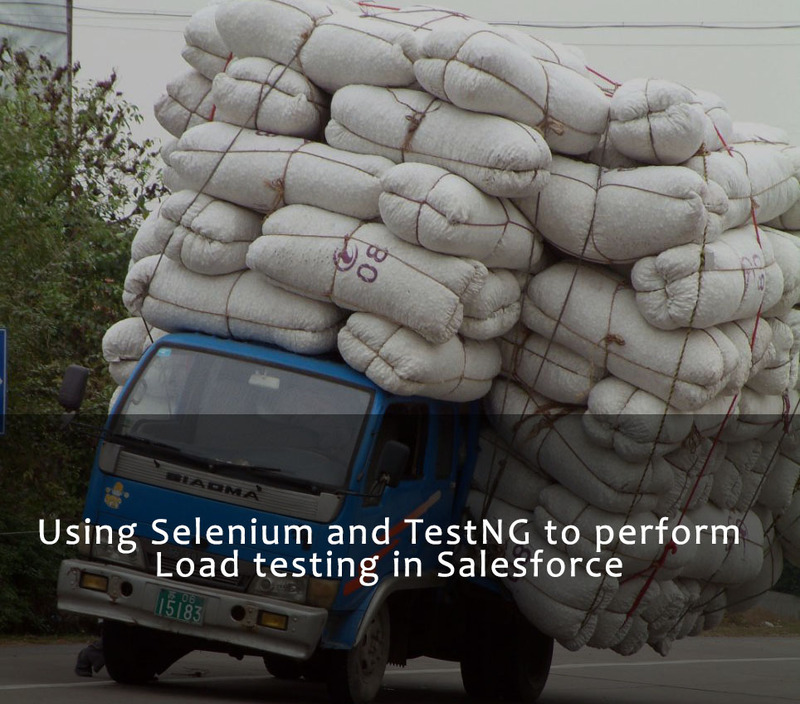 Quickly I realize that its time to call my friends Selenium and TestNG. Before doing any extensive stress or load testing on Salesforce, we must need to contact Salesforce support and explain them what we are trying to achieve. More detail available in this official Salesforce blog post. I have published some blog posts about Selenium in past as well however whats different this time ? I need to determine after how many simultaneous user interactions, I would hit Concurrent Apex Limit error as shown in below image. ANT is very powerful and one of the most used tool in Java and other platforms like Salesforce. In Salesforce, ANT is officially used to deploy changes on instances using Metadata API. It is also integral part of Continuous Integration. Even though, there are hundreds of libraries and ANT Tasks are available to use, however there are many scenarios where we need to create our own custom Task. I am using many custom ANT tasks in my projects and its very easy to create. For example, I have created automated data load process with custom ANT task, which is almost as powerful as of any paid ETL tool. Either from the context menu or from the menu bar’s File menu, select Export. Expand the Java node and select JAR file. Click Next. In the JAR File Specification page, select the resources that you want to export in the Select the resources to export field. Select the appropriate checkbox to specify whether you want to Export generated class files and resources or Export Java source files and resources. (Note: Selected resources are exported in both cases. If there are other files or resources you want to include they must be in a an open project. Browse to their location via the directory tree on the left and ensure the file or resource is checked in the window on the right. In the Select the export destination field, either type or click Browse to select a location for the JAR file. Select or clear the Overwrite existing files without warning checkbox. If you clear this checkbox, then you will be prompted to confirm the replacement of each file that will be overwritten. Click Finish to create the JAR file immediately. Now, navigate to the location you specified for the jar. The icon you see and the behavior you get if you double click it will vary depending on how your computer is set up. You can use this article for images and more detail. Recently, I came across requirement to create ExcelSheet from thin Java Client used by Salesforce. So, I though to share my experience on Creating Excel Sheet in Java. As we know that Java is product of Oracle and Excel is product of Microsoft. Off-course, There will be no standard functionality available in Java to achieve our requirement of creating Excel Sheet. However thanks to Apache for their POI Library. POI Stands for “Poor Obfuscation Implementation” as the file formats created by this library is obfuscated poorly with help of reverse Engineering. Anyways, we don’t have to bother about it and thankful to them for providing such wonderful library. Apache POI library can be used to create Excel Sheet, Word Document and PowerPoint. In this post, we will be totally focusing on Excel Sheet using “XSSF (XML Spreadsheet Format)” component. What is the problem that hibernate is trying to solve? Let’s take an example of simple class that you have in your application. Referring Image 1, we have Employee object in our java class which has six fields. In our running application We would have lots of such objects in memory, What if I restart my application ? Everything will be lost. 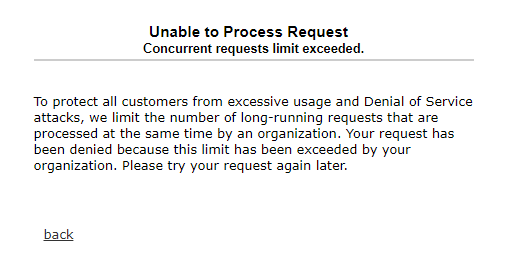 So to overcome this problem and persist data inside my application i will save it in Database. As shown in below image every object in Java will be represented as single row. Here, class corresponds to table and object of class corresponds to row. This was something that we were been doing over the year (Off course before ORM Tool). Hello Readers, in this article we will see step by step procedure to deploy your first (Hello World) program in Heroku. There are two ways, first going through series of Commands of “Heroku” and “GIT” and other simple and smart way is to use Eclipse Capability with Heroku. To make things easier we will go by second method. This tool / blog post is deprecated. 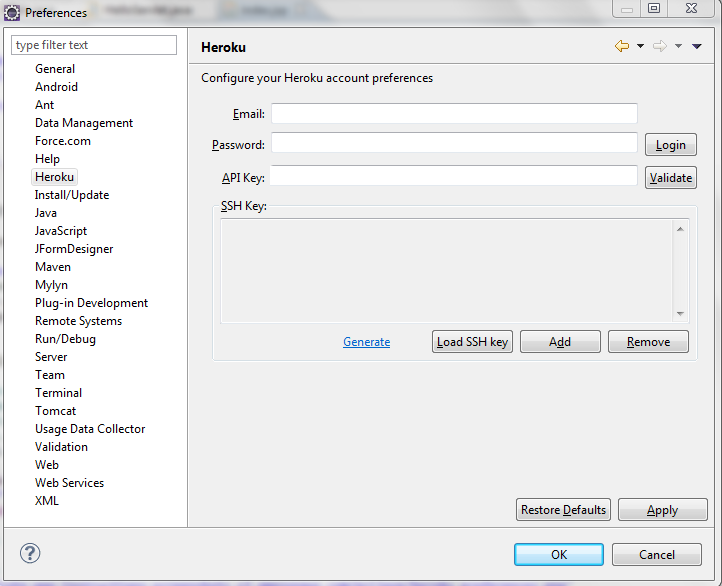 Please follow this guide to deploying applications to Heroku from Eclipse. If you still want to follow this post, then download Eclipse plugin for Heroku from here. First we will need to Install Heroku Plugin in Eclipse. To install it, Navigate to “Help | Install New Software” and click on “Add” button. Give any name in website like “Heroku Plugin” and enter this URL in Location https://eclipse-plugin.herokuapp.com/install and click on “Ok” and Finish Installation. It will install the Heroku Plugin required to start your first Plugin. Navigate to “Window | Preferences | Heroku”, Here either enter your UserName and Password of Heroku Account and click on “Login” or enter you API key, which you can find by logging into your Heroku Account. This is very short tips to resolve the errors “ArtifactTransferException: Could not transfer artifact” that may occur in Maven project in Eclipse. Open folder by running this text (without Quotes) in Search Explorer of Window “%USERPROFILE%.m2”. After running above command, “m2” folder of maven will open. Now search for file (without Quotes) “*.lastUpdated”. In this step, delete all the files found by running Step 2. Now go to Eclipse project and select “Maven | Update Dependency” or “Maven | Update Project”. By now, your issue will be resolved. Its long time, since i wrote any article because of my busy schedule However this time i came with advance one. In this article we are going to use the J2EE (Servlet) to Merge PDF attachment inside salesforce with the help of OAuth and ITextPDF jar file. The reason of writing this article is that there is no native support by Apex to merge two attachments in Salesforce. Either we have to go for AppExchange product like CongaMerg or Drawloop or we can write our own code in any other language like Java and C# and with the help of REST API we can save get and save attachment in Salesforce. 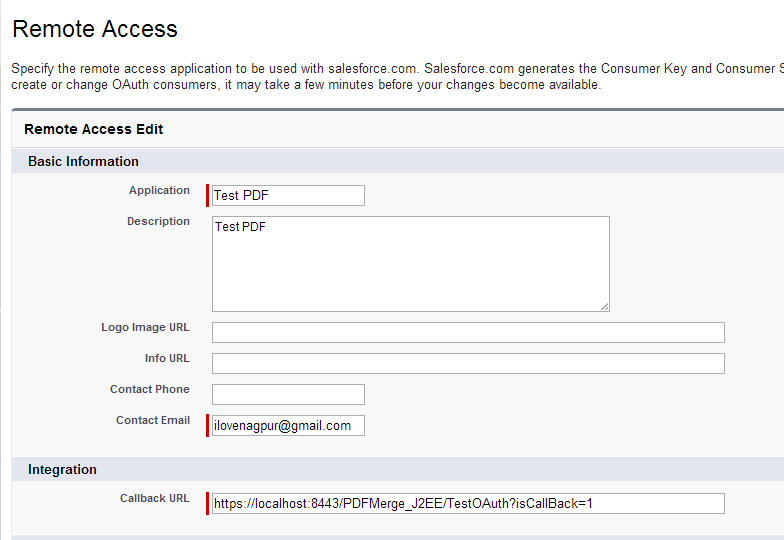 First we will need to setup the OAuth permission so that our local J2EE application can interact with Salesforce. For this login to Salesforce account and Navigate to “Set up | App Set up | Develop | Remote Access” and enter the information. Be careful about the “Callback URL”. It must match in your code. After creating the “Remote Access”, note “Consumer Key” and “Consumer Secret” which will be needed in your code. Update : “Remote Access” is renamed to Connected App. So throughout this article, if you see image of “Remote Access” then please consider it as Connected App. I have enabled SSL in tomcat many times however initially I struggled to get it in running condition. So I thought to share a simple approach I am following now days. Run tool “Keytool“ provided by the JRE to create a “keystore file”. Where “D:/.keystore” is the path where file should be created. 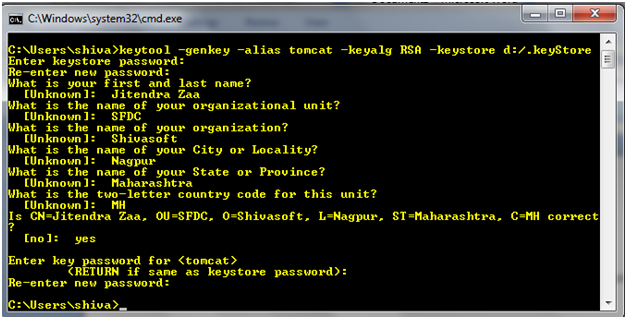 Instead of alias “tomcat” any other name can be used. This topic has always been part of discussion where the answer is not satisfactory and convinced to others. Using this article, I will try to explain the concept of parameter passing in Apex Method. This Complete topic is applicable for Java also. Before moving ahead let’s have a summary on what is “pass by value” and “pass by reference”. “Pass by value” means when a method is called, a second copy of the parameter variable is made in memory, and this copy is passed to the method as a parameter. This copy can be modified in the method, but the original variable in the caller is unchanged, and the changes to the copy are lost upon return. “Pass by reference” means when a method is called, that actual variable is passed to the method. Question: parameters in method are passed by value or pass by reference? Maximum answers: primitive data types like Integer, Double are pass by value and Objects are pass by reference. However, the above statement is not perfect. Correct Answer: parameters are passed by value in Apex as well as in Java. Where, in case of object the copy of reference is first made and then passed, therefore we can change the fields of object inside method however we cannot change the Object itself.